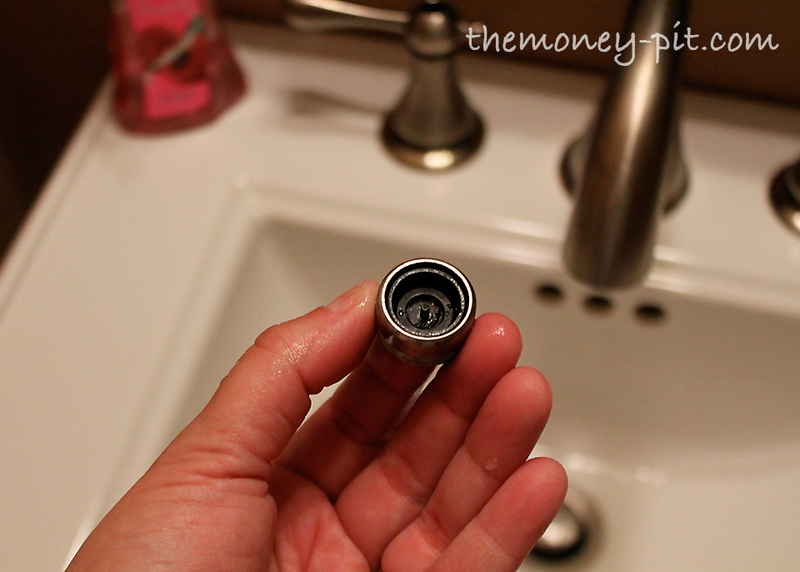 Good Girl Gone Redneck: Can you be a Ms-Fix-It? Yes. You. Can. Can you be a Ms-Fix-It? Yes. You. Can. 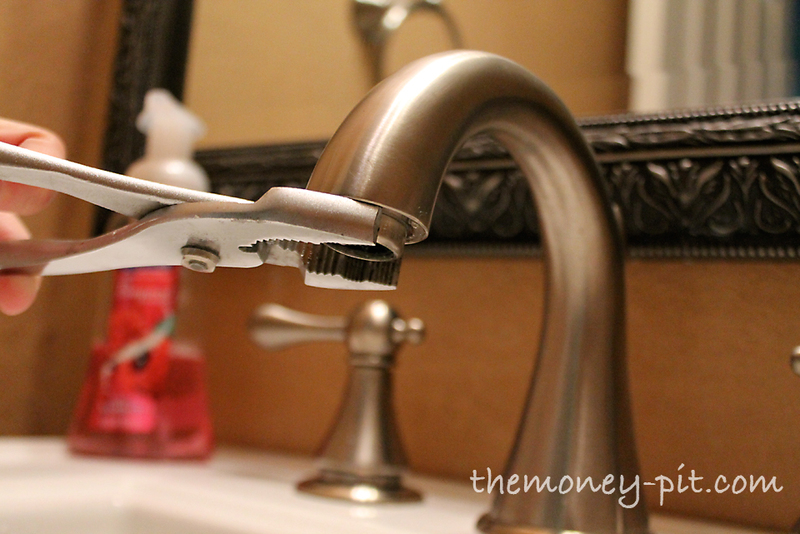 I'd like to take a moment to introduce you to my friend Kim, who blogs over at The Money Pit. When Andrea asked me to guest blog on GoodGirlGoneRedneck I was super excited. 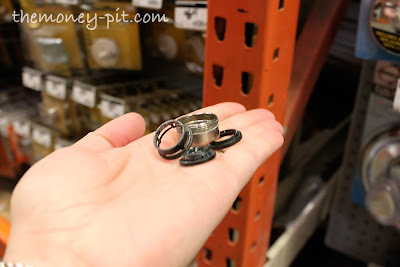 I always love to share my love of home improvement and DIY projects, especially with other women/moms and I knew her readership was right up my alley. If you aren't a fellow DIY'r (or if you think you don't have the skills or desire to do simple repairs or improvements in your house) don't stop reading! Trust me.. once you see how easy it really is, how much money you can save doing it yourself, and how great it comes out when you are through you are going to be empowered too. A lot of women I talk to are afraid to tackle projects at home and often lament that it is "their husband's area of expertise." But I know if I waited for my husband to get around to a 'Honey Do' list I would die before it happened. And that is how I got started blogging about home improvement. I bought a house.. it needed a LOT of improvement.. and I had no money and nobody else willing to do it. It was up to me. My number one piece of advice for anyone thinking about tackling a project but freaking out because they feel clueless is this: DON'T BE AFRAID! With the exception of a few things (like electricity), a home improvement project (even if you screw it up) will not kill you. You can do this! And if you aren't sure what you are doing, that isn't a reason to not try. There are so many people out there who are willing to help you, just ask. 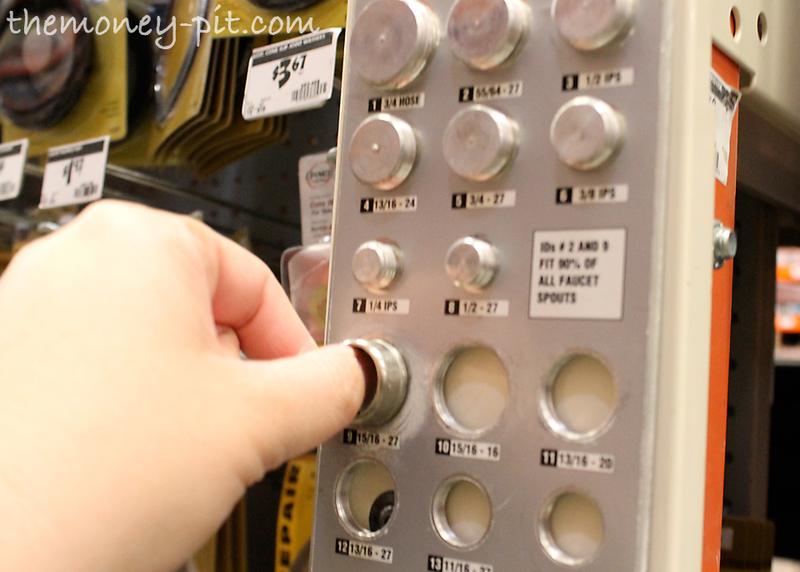 Hardware stores aren't just for boys anymore! Don't be intimidated. So jump right in. Inspired by something on Pinterest? DO IT! 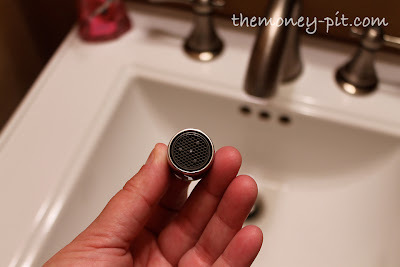 Something not working around the house and it is driving you nuts? GOOGLE IT! YOU CAN DO THIS.. DON'T BE AFRAID! Pep talk over. Time to talk DIY! How 'bout Plumbing?! Since we moved into our current house, the powder room faucet has always sprayed crazily. An explosion of water in all directions (I didn't even know water could do an 180 degree turn, but it can!) I have spent the last 6 months of my life wiping water stains off the mirror. My husband told me to call a plumber and have the faucet replaced. In my case I immediately realized what the problem was. Ah Ha! Off to the hardware store! 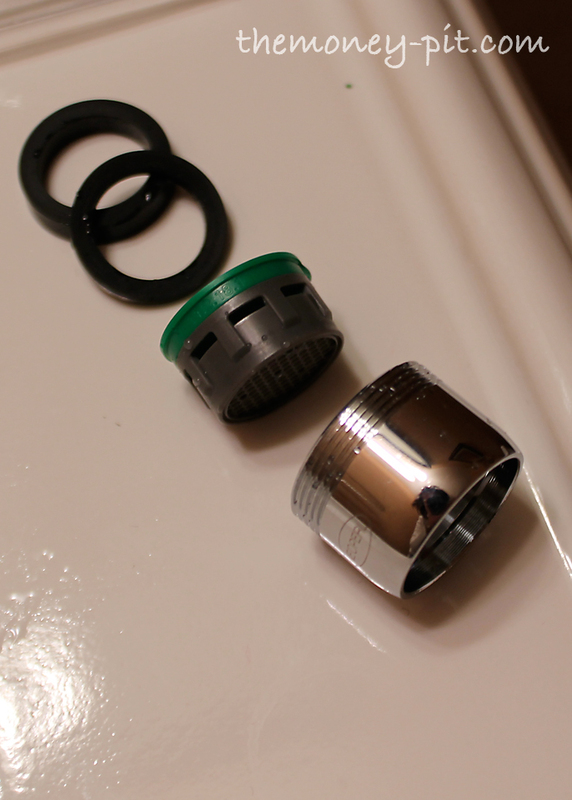 When selecting a new aerator there are TONS and TONS of choices. It may be intimidating, but it isn't impossible. 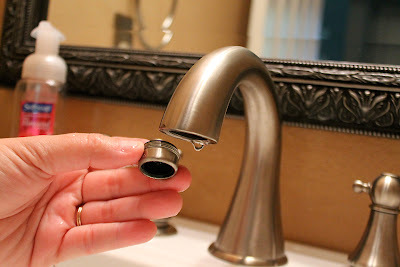 How big is the spout and how is it threaded? 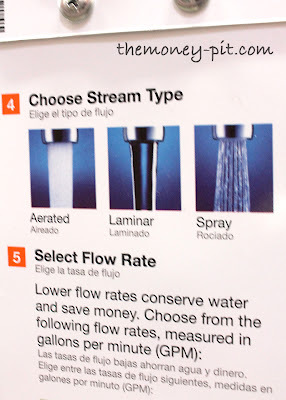 What flow rate do you want (how much water comes out)? What type of flow do you want? You don't know the answers? Ask for help! 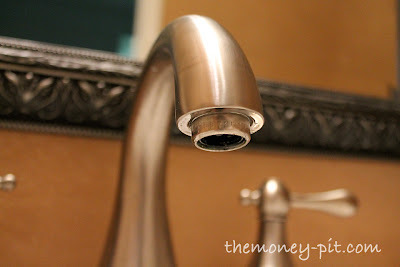 Question 1: How big is the spout and how is it threaded? In my case it turns out that I had a 15/16 inch (27 thread count) spout. 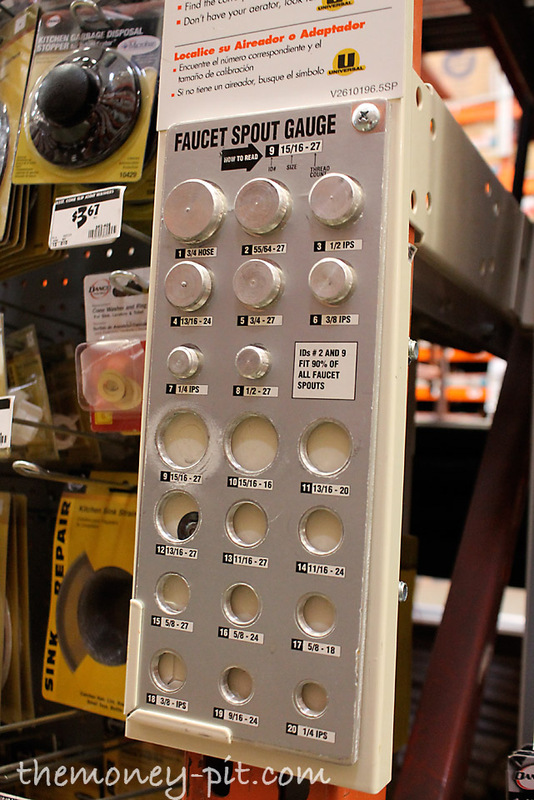 That sign actually says "90% of faucet spouts are 15/16" Well, whoda' thunk! Question 2: What flow rate do you want? My spout (like most) had the flow rate printed on it: 2.2 GPM (gallons per minute.) 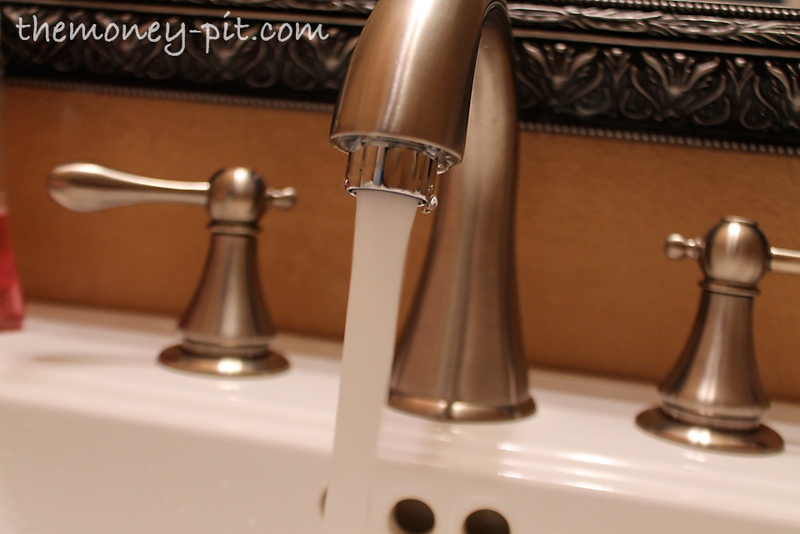 Because we live where water is pretty valuable, and because the powder room is where my kids wash their hands (AKA play in the water) I decided I wanted to cut down on the flow rate. Low-flow aerators range from 1-1.5 GPM. I settled on a 1.5 GPM replacement. Question 3: What type of flow do you want? Well, in my case I wanted ANYTHING that wasn't "spray all over every surface." 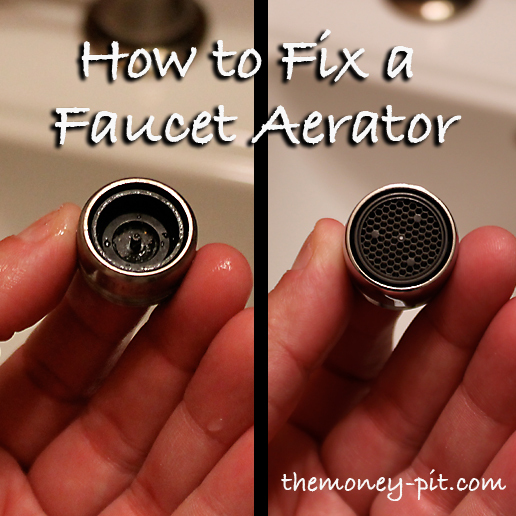 I decided on aerated, since that is typical for a bathroom faucet. This is all personal preference. 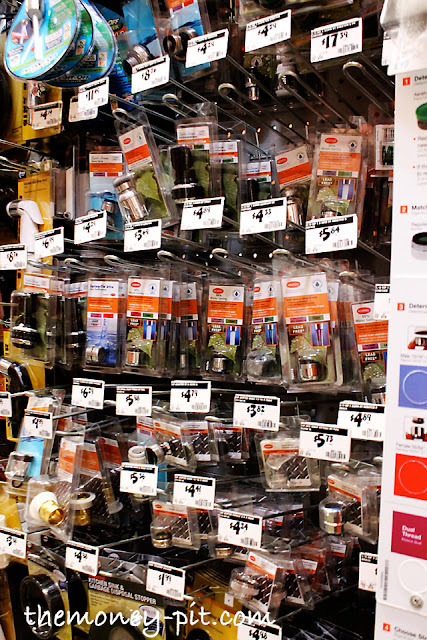 Now that I know what I need, I find it on that giant wall of faucet parts**. When you get it out of the package you can clearly see difference between it and the one that wasn't working correctly. This one has a screen to keep the water aerated. Now screw it back onto the faucet and you are DONE! That is all there was to it. Now get out there and tackle those projects! Don't be afraid! 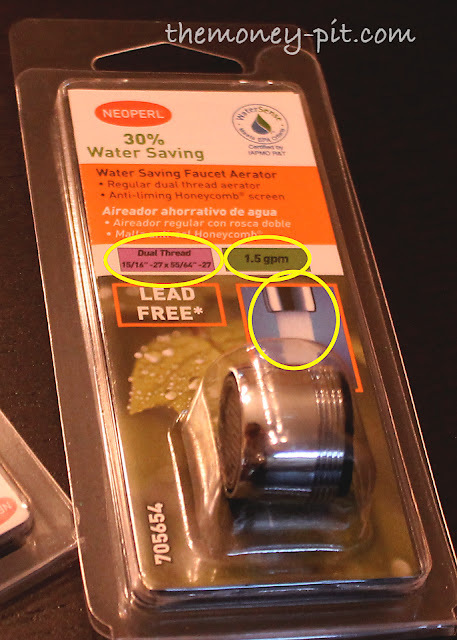 **Another option was to buy just the plastic insert and reuse the metal spout that was originally on my faucet. My home depot was sold out of the small inserts that fit, so I settled on an entirely new spout. I try to be handy but I'm not. I will have to try this next time I need to replace it. My recent trip to IKEA *may* have been inspired by Kim... now I have bookshelves I plan to un-IKEA-fy and I will definitely post before and after pics...it will probably take months, but I'll get to it! Wow! I just take the part to the store and ask someone for help! Your guest poster is amazing! This is right up my alley. I love when I can fix something myself. I will definetly link to her blog.